Alt-rock trio The Joy Formidable don’t do small. 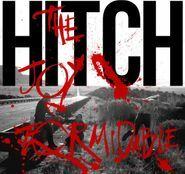 Their third album, Hitch, is stuffed to the brim with LOUD distorted guitars, furiously nimble riffage and rumbling beats that seem intent on shaking lightning from the skies. Yet frontwoman Rhiannon “Ritzy” Bryan remains utterly capable of making all that Smashing Pumpkins-esque wattage humane, pairing the power chords with attitude reminiscent of The Pretenders’ Chrissie Hynde. “The further I run, the faster you apologize,” she deadpans on the killer chorus of anthem “Radio of Lips.” The band unveils its chops on “The Last Thing on My Mind,” a great kiss-off that sees the band infusing its sound with heavy blues riffs, while Bryan’s breathy drawl takes center stage on songs like the PJ Harvey-ish “The Brook” and the orchestral acoustic ballad “Underneath the Petal.” Hitch harkens back to the ’90s not only in sound, but in the way in which the band puts every inch of themselves into the album. The Joy Formidable are leading the charge back to alternative rock of epic proportions. We’re so in.